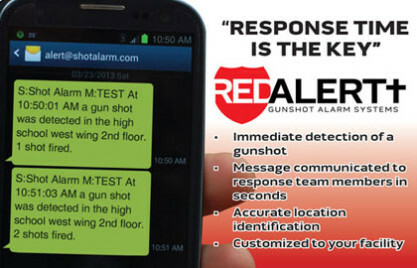 Shot Alarm (Red Alert+) - Gunshot Alarm System - Response Time is the Key! Call us toll free at 608-355-2006 to order your copy of RedAlert+ Gunshot Alarm Systems Software. A sophisticated software system that detects the audio signature of a gunshot within the interior of a building. Response Time is the Key! Nation's first gunshot alarm system designed with schools in mind. Red Alertt, LLC has developed a sophisticated software system that detects the audio signature of a gunshot within the interior of a building. Once the software, Shot Alarm, detects a gunshot, it automatically sends a message to preselected emergency response team members. Information contained in the message will include the exact time of the occurrence, whether multiple shots were fired, and the location of the shots within the building. The message will be sent via text message, email, instant messenger and/or other communication devices. Shot Alarm filters out sounds similar to gunshots such as thunder, breaking glass or other false positives. It is a fully automated system that requires no human interaction once set up is complete. Red Alertt’s Shot Alarm is a multi-channel and real-time audio analysis system that was developed to recognize the audio signature of a gunshot. It is a fully automated system that requires no human interaction once set up is complete. If a gunshot is discharged within a building, Shot Alarm detects the gunshot and automatically sends a message to preselected emergency response team members. Information contained in the message will include the exact time of the occurrence, whether multiple shots were fired, and the location of the shots within the building. The message will be sent via text message, email, instant messenger and/or other communication devices. Shot Alarm filters out sounds similar to gunshots such as thunder, breaking glass or other false positives. The system is tailorable, allowing for support to existing emergency plans or whole scale automation. In either case, our system is the catalyst to your awareness of an emergent situation. 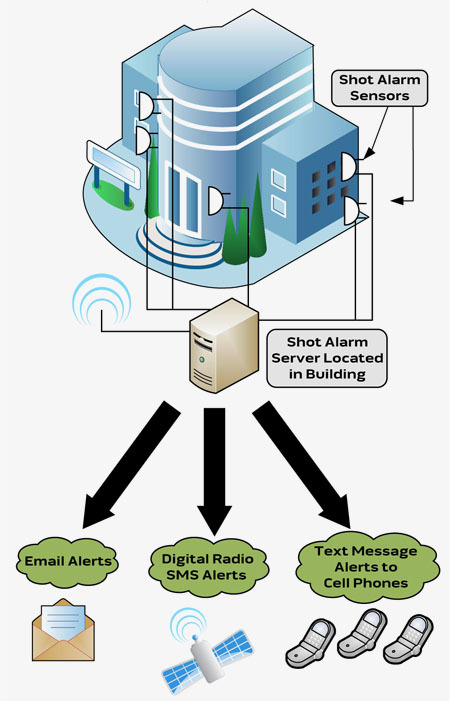 Shot Alarm is an automated gunshot detection and alert system that triggers a call for emergency assistance in seconds. Depending on your needs, Shot Alarm can be programmed to trigger a silent alarm to emergency responders or to set off an audible alarm that makes others in the facility instantly aware of danger. This allows everyone to move into implementation of their prearranged response plan. Shot Alarm is a software system designed to notify emergency responders in the event of a gun being discharged within a building. If the system detects a gunshot, it immediately sends a message to preselected emergency response team members. The message will include the location of the shot, time of the shot and whether multiple shots were fired. What types of facilities could benefit from Shot Alarm software? Any location that has groups or gatherings of people is ideal for Shot Alarm. Some examples include office buildings, hospitals, restaurants, government facilities, shopping malls, airports, banks or universities. Will a person need to notify the emergency response team or call 911? Shot Alarm does not replace 911 calls. Our system enhances and expedites the transmission of important information that law enforcement can use to protect and save lives. Will the system pick up conversations? Shot Alarm is designed to record sounds in a continuous loop at predetermined intervals. Once the interval has passed and no gunshot was detected, the system will start new recording and NOT hold any previous sounds in its memory. If a gunshot is detected, Shot Alarm holds the recording indefinitely until it is manually programmed to stop recording. This recording is very beneficial as investigators determine the sequence of events in a shooting. Once our facility is supported with Shot Alarm, can we implement simulated emergency tests or drills to practice our emergency response plan? Absolutely and it is encouraged that drills are performed. Shot Alarm will host a training session at your facility and the procedure for simulated drills will be including in the training. Your staff will be fully aware of how to implement tests and drills. How do we know the system is fully functioning? Red Alertt continually monitors all the locations that use Shot Alarm. Daily health checks are performed on the sensors and hard drives to make sure there have been no power outages, wires cut or other interruptions to the system. What if the power goes out or towers/lines are down? The hardware installed with Shot Alarm comes with a battery backup that will last at least 1 hour. Notifications will be sent to staff that your facility has selected to notify them of a power issue. In the event of an interruption in telephone service, our system will optionally utilize its mobile radio form of transmission thus avoiding telephone lines and cell phone towers. Will thunder, fireworks and other loud “bangs” create false positives? Our system is designed to capture the audio signature of a gunshot, additionally it uses sophisticated algorithms to eliminate or reduce “false positives”. What if we have problems once we have the system installed? Shot Alarm comes with installation, configuration, maintenance, training and support. There are no end-user interactions with our system other than maintaining a list of responders. Red Alertt tech support is available in varying degrees and is determined when a maintenance agreement is selected. Shot Alarm (Red Alert+) - Gunshot Alarm System is a product of Ryte Byte, Inc.